Diplomă de medic emisă de un colegiu sau universitate autorizata. Experiență clinică de minim trei ani în ingrijiri de boli grave; un an de experiență practică în Asistență Cardiacă Avansată; un an de experiență în diagnosticarea și tratarea unei game vaste de afecțiuni medicale. Cazarea : cazare in cabina "single"
Programul de lucru : Medicii și asistentele medicale lucrează în ture de la orele 8:00 am la orele 11:00 am și de la orele 3:00 pm la orele 6 pm și preiau apeluri și în afara orelor de program. Turele se rotesc astfel încât să permită angajaților să aibă și timp liber. Guest and crew medical care for minor to major emergency situations as well as the general medical care of all crew members including preventative medicine and care of chronic conditions while reporting necessary cases to the different port and health authorities of the different ports of call. To provide medical services to all Crewmembers and Guests. The Doctor shall assist the Staff Captain and Senior Doctor in all shipboard health-related matters including outbreak prevention, and illness reporting as required by international, national and company policies. In order to consistently exceed guest expectations and provide the highest levels of product and services, additional duties and responsibilities may be assigned as needed. Required Documents upon Boarding Doctors must bring the following documents or their photocopies with them when they arrive to the ship: Medical School Diploma or equivalent, ACLS, PALS, ATLS and professional license certificates that are valid for the entire lengths of their contract. It is the responsibility of the Doctor to take the courses and tests that are necessary to keep these licenses valid along with any necessary post graduate credits. · Reports directly to the Senior Doctor, and for medically related issues, reports directly to the Director of Medical Operations or the Chief Medical Officer. 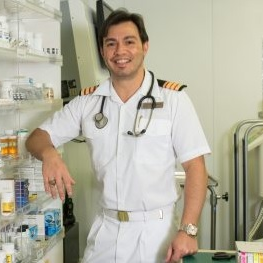 · Serves as advisor to the Master and Staff Captain on all matters related to Medical Center services, Guest, and Crewmember health matters and hygienic conditions onboard the vessel. · Holds a Basic Safety Course Certificate and appropriate licenses and certificates as required by regulations. · To be present during all clinic hours when on duty or as required by the demands of the clinic. Supervises and provides competent medical care to both Crewmembers and Guests as required, keeping the Master and Staff Captain advised of all matters of consequence. · Responds to all codes on board the ship even when off duty. · When the patient waiting times are greater than ½ hour or the number of people waiting to be seen by the Doctor is higher than normal, or any combination of these situations has the potential to generate a negative atmosphere, Doctors are expected to willingly cooperate with each other. In this way, waiting times will be reduced and user satisfaction increased. · Oversee inventory of medical supplies and monitors hospital budget. The Doctor, together with the rest of the medical team, is responsible for the annual budgeting of the Medical Center’s consumable supplies and medications. · Conserves a confidential relationship between Doctor and patient. However, if the Doctor suspects a serious contagious illness which could affect the well-being of others, the Doctor will report directly to the Staff Captain and shore side to the Director of Medical Operations or Chief Medical Officer. · Preserves a professional working atmosphere. This includes providing adequate privacy while examining patients. In the event a male physician examines a female patient in any state of undress, the ship’s female Nurse shall accompany him. · Participates in monthly safety meetings, assists in making recommendations which improve overall safety of the ship. · Oversee the administration and safekeeping of all medications and drugs in accordance with regulations and Company policy. At least once a month or when there is a change in medical staff, a drug count shall be held, which the Staff Captain or the Chief Security Officer shall be present to verify. · The Doctor shall have an understanding of the Safety and Quality Management System (SQM) and carry out the policies and procedures appropriate for his/her position. · · Participates in inspections of the galley and food handling areas and provides expert assistance in regards to sanitation and compliance with USPH and CDC regulations or any other Public Health authorities. · Assists the Safety Manager, in the orientation of new Crewmembers as to safety and personal hygiene. · The Doctor shall stay in close contact with the Director of Medical Operations and Chief Medical Officer as necessary and for all medically related methods and practices. · The Doctor’s primary responsibility is the care of guests and crew members. · Performs other related duties as assigned or as directed. The omission of specific duties does not preclude the supervisor (Senior Doctor, Staff Captain or Director of Medical Operations) from assigning duties that are logically related to the position. · The Doctor will document in the patient’s medical record the nature of the consultations, past medical histories, physical examination findings, diagnoses and differential diagnosis, analysis of the cases, laboratory findings, referrals, plans of action, etc. · The Doctor will follow the company billing practices accordingly. · The Doctor is not authorized to waive medical fees except in those cases where company policy specifically indicates that there are no medical charges. The Staff Captain or the Ship’s Master are the only ones authorized to waive any medical fees. In that case, this must be specified in the patient’s medical record. The Doctor’s primary responsibility is the care of guests and crew members while supporting the public health operation of the ship including reports requested by the respective authorities. · The Ship’s Doctor position is considered to be a Senior Management position, as such, the behavior on board the ship must be impeccable and characterized by courteous treatment of guest and crew. The decorum outside the Medical Center must be of the highest standards. Excessive alcohol intake is unacceptable. · The Senior Doctor and Doctor shall alternate after-hours on-call duties and cover for each other during shore leave, or as otherwise required by the Staff Captain. · The incumbent must be able to work in a multi-cultural environment; also, must be able to adjust to changes in schedules, assignments and deadlines. · The Doctor makes a commitment to our company that he or she is competent to handle the medical situations that can be expected to arise abroad a cruise ship. · All team members must be physically able to participate in emergency life-saving procedures and drills. All vessel positions require full use and range of arms and legs as well as full visual, verbal and hearing abilities to receive and give instructions in the event of an emergency including the lowering of lifeboats. · Work within different temperature changes - indoors to outdoors. · Able to pass basic safety course. · This is a minimal description of duties. Other work requirements may be necessary and assigned as business or maritime law dictates. Medicul de la bord oferă servicii medicale tuturor angajaților de pe mare și oaspeților și ajută Căpitanul și Medicul Primar în toate chestiunile legate de îngrijiri medicale acordate pe mare, inclusiv raportarea îmbolnăvirilor și prevenirea epidemiilor. Supraveghează bugetul clinicii/spitalului și inventarul de provizii medicale. Doctorul ajută și la instruirea membrilor de echipaj din punct de vedere al siguranței și igienei personale și verifică galerele și zonele unde se manipulează mâncarea. Trebuie să dețină diplomă de medic emisă de un colegiu sau universitate de renume; certificate ATLS (sau ITLS), BLS și PALS; experiență clinică de minim trei ani în Îngrijiri de boli grave; un an de experiență practică în Asistență Cardiacă Avansată; și un an de experiență în diagnosticarea și tratarea unei game vaste de afecțiuni medicale – acestea sunt unele dintre cerințele postului.